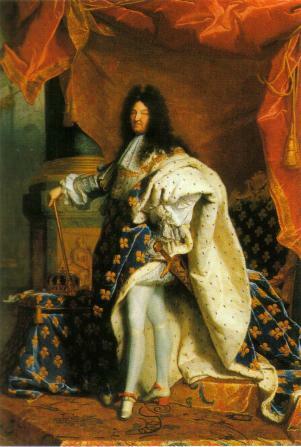 In his later rigidly controlled years it was said of Louis XIV that if you knew the hour of the day, you would know what the French King was doing at that moment. As a man who lived his private life in public, and whose every move was meticulously noted by ministers, doctors, courtiers and any number of letter and diary writers, little remains undiscovered about the Sun King. In re-treading his multi-recorded life, it’s a question of what aspect of the absolute ruler you illuminate. Antonia Fraser chooses to concentrate on Louis’s relationships with the women in his life. Just to see the family tree of Louis’s progeny is to realize that the subject certainly warrants a whole book. The legitimate offspring from his marriage and “legitimized” children by his mistresses en titre spread across the inside covers of the book in a web that grows more confusing with inter-marriage and interchangeable names – the sons usually named Louis and the daughters Louise-Francoise or Francoise-Marie. The earlier part of the book explores aspects less touched on in other biographies. Fraser examines the importance of his mother, Queen Anne of Austria, and her mismatch with Louis’s weak and sexually ambivalent father. This strong woman, aware of her Hapsburg grandeur, concentrated all her love on the son born after 22 years of a childless marriage. Louis’s feelings towards women were formed by his mother, who also instilled in him the sense of his own greatness. Anne put paid to a youthful romance with Marie Mancini, niece of Cardinal Mazarin, telling a confidant after a stormy interview with her tearful son, “One day Louis will thank me for the harm I have done him.” The way was then clear for her to engineer his marriage with her niece the Spanish Infanta, Marie-Therese. Louis – handsome, virile, rich, and above all, King – would have had mistresses in any case, even if Marie-Therese had not been so dull. A near affair with his sister-in-law, Henriette, sister of Charles II, was deflected when his eye fell on her maid-of-honour Louise de la Valliere, who was ousted in her turn by the spectacular Athenais, Marquise de Montespan. The years with Athenais were the highpoint of the Sun King’s glamour. As Fraser notes, “Like Versailles, she was expensive – and glorious.” During her reign Versailles was transformed from hunting lodge into a great palace, with gardens landscaped by Le Notre. These were the years that inspired Charles Perrault’s fairy tales of enchanted palaces and charming princes. Abundantly fertile and sexually enthusiastic, Athenais had six children with the King. But because she was married to a troublesome husband, they were hidden away under the charge of an impoverished friend, the Widow Scarron. By 1680 Athenais had been displaced as mistress by her children’s governess, who became the Marquise de Maintenon, and morganatic wife to the King after the death of the Queen. Many biographers – and novelists – take sides for or against the rival mistresses. Montespan is sometimes dismissed for dabbling in witchcraft and having a violent temper, and Maintenon for being a religious bigot. Fraser, more even-handed, sees the King’s gradual falling in love with Maintenon, three years older than him, as a return to the pious, controlling mother of his youth. From 1684 – around the time of the secret marriage – Maintenon (whom Fraser refers to as Francoise) kept notebooks of moral sentiments, one of which – “Keep a rule and it will keep you” – is reminiscent of Mae West’s thoughts on diaries. The last years of the King’s life, blighted by a devastating war he had started, a famine and the deaths of all his direct descendants, apart from his great-grandson the future Louis XV, are like a morality tale. But Fraser brings the book to a heroic ending as Louis faces his own death at 76 from gangrene, with his usual self control, acknowledging the “severe judge” in heaven to whom even Kings must submit. And despite the female casualties “wounded in the King’s service”, she feels there were far worse options for women in the 17th century than being the King’s mistress. Such as being the daughters and nieces condemned by Louis to unhappy marriages, for the sake of his dynasty.